​Each of our rooms is named after the view you can admire from the bedroom windows, they are all spacious and bright, with private bathroom, air conditioning, Wi-Fi and mini-bar. Some have a walk-in wardrobe, making storage of your belongings easier. Casa Soresina welcomes small pets but smoking is not permitted inside the building. 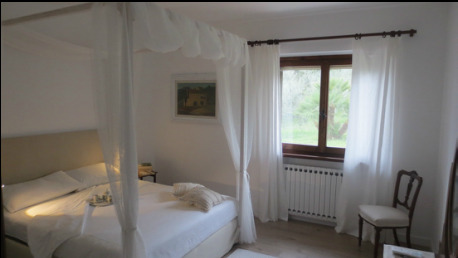 ​The light canopy over the bed invites you to lie back, relax and enjoy the silence. The furnishings are all original items from the house that have been restored and given a new look. The room has a wardrobe and a bathroom with shower and bath. ​The bed is right in front of the window and boasts the best view of the house. A spacious room with a sofa and a mini library. The private bathroom has a large shower. ​The Kiwi room is on the first floor, it is light and airy with a French-door giving direct access onto the terrace, another overlooks the pergola of kiwi (Actinidia). The bathroom has been completely renovated.